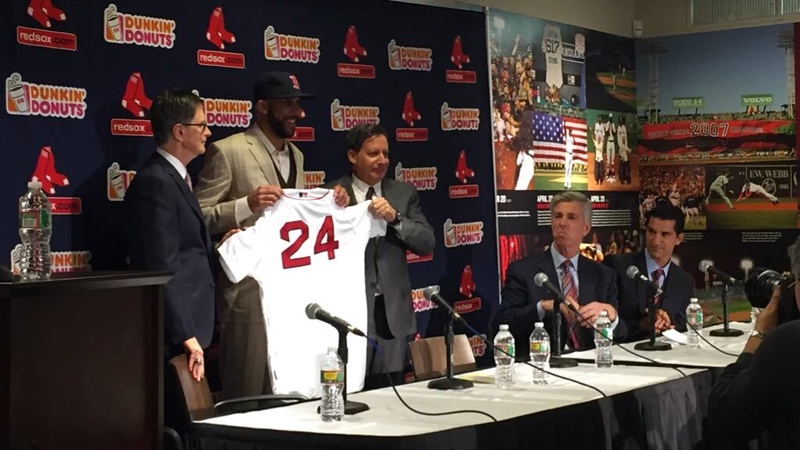 The Boston Red Sox introduced new ace David Price at Fenway Park on Friday. Price just recently signed the largest contract for a pitcher in MLB history (until Greinke signs). That seven year, $217 Million will pay him $31M a year, or 98¢ per second. It didn’t take long for Price to make an impression. When asked about his postseason struggles, he wittingly responded, “I think I was just saving all my postseason wins for the Red Sox.” The 30 year old Price will wear 24, instead of the retired 14, in honor of a friend. Price did acknowledge the “war” between him and future Hall of Fame DH David Ortiz, saying that when he was traded to the Detroit Tigers he wasn’t fond of second baseman Ian Kinsler, but they quickly became friends. Price says he wants to put this all behind him. Ortiz was called before the signing, and told the Boston Globe, “I told them I got no problem with it. All that matters to me is winning.” Thursday Night. So, we’re leaving it up to you. How many World Series Championships will Boston win with David Price? Vote on our poll below!